Thank you @Andy Somerfieldfor this great one. This one deserve a test as soon as i get the jewel downloaded and installed. So good to read, this is great improvement. had no struggle with the crop tool (did a lot of crops in the last 48h) but i salute this one improvement. Blessings to the team ! WRONG!!! That doesn't require more information before completing the action. 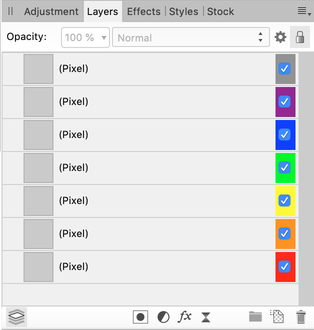 The action it performs is to add the adjustment layer, and it does that without prompting. The fact that the layer's edit window is opened is not the same thing as requiring information to complete an action, so this should NOT have the dots. 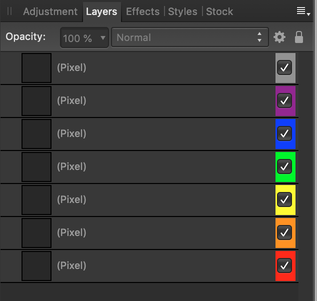 The new layer coloring feature, great addition, appears to be limiting me to the 7 set colors. Will there be an option to assign more or have an option to choose our own? What if there are more than 7 colors needed? this feature is so good but ... the colors looks dimmed and not natural, i mean the Red is kind of darkish. i don't know if it's me but the colors are not reflecting brite life that Affinity brings. Also please make it possible for us to add more tagging colors or create our own tagging color palette which fits our workflow as we don't use the same colors used by everyone to do the same kind of job. Also i like the way icons have been refined just by looking at the bottom icon set (Mask, Adjustment, Fx and Live Filters...) it is more professional and less bigger thus making me feel better just by looking at it. The monochromatic icons display is not yet updated to fit with this Professional look but can wait until it is updated. Auto Levels, Auto Contrast, Auto Colors and Auto White Balance does nothing to a picture loaded unto the Software. i may be missing something with it but i can click tons of time nothing changes compared to older version (precisely 1.6 cycle). Burn & Dodge tools have no effect on layer masks ... bug ? i mean here i tends to use Dodge or Burn tool to refine edge and remove fringes or exceeding contour; by pressing Alt+Click on Mask i should be able Burn tool on Shadows and Dodge on Highlights with the dedicated tools but ... it does nothing in this version or maybe missing something here too. Tone Mapping Persona still takes a lot of time to load also its applies without asking the last used Preset, which is a bit confusing, i mean the Tone Map should load its interface without Auto Applying any previously select tone map, i should see the photo/picture in its default state/appearance then from that point i can make my choice: Apply a preset or fine tune the thing using my own adjustments. Here also ... bug or ? Blessing for this release as it is much faster in general and seems to be the open door to new Affinity Feeling. Bright on my High Sierra machine. I definitely hope there are plans to make the colours customisable because they are far too intense and saturated for my taste. This is how colours look currently. They don't look "dimmed" quite the contrary actually. Are yours different in any way? I am on 10.12 and the ones I tried when I was playing with this last night (including red) looked fine to me. The color palette of the current persona icons would be a great palette to base these on IMO. On my mbp pro the latest beta works really fast and without a big problem. There were some problems with the fx ( especially frame function) but this was no big thing. I have to check this in the next days to find the trigger for this. Are yours different in any way? Was offline for hours, but Yes it is different, so maybe something with my settings. Was thinking of doing calibration but still need to source a calibration device for that. Thanks for yours answer, appreciated ! While that is certainly a great idea, I rather doubt it would make any difference with this particular issue. Well did anyone noticed that the blemish removal tool in the development persona now work better and does better fix suggestions? Also found the inPainting tool is much intelligent and does apply correction much faster too. Still something like the new inpainting method on PS is really needed but want it more intelligent but this is another story. Drag and Drop of Afassets from Finder to Photo not working but displaying this message. Was this forgotten for this build release ? I'll get this looked into for you. Thanks Uncle Mez! Was thinking if you could make it possible to have different sizing for layers and sub layer? i mean here I would be able to chose big or medium size for layer but I also should be able to set a different size for sub layers in this case small or medium all this depending on how I organize my workflow. once again sorry for posting this here but today I'm struggling no power and posting from my very old iPhone 4.